The course is currently closed, but click here to get an invitation when it reopens. Writing is my passion; I can’t live without it. But it takes constant exploration, reading, and practice. I can’t seem to get the voice right in my prose; I sound either pretentious or boring. You want a shot at greatness, but you need a bit of guided knowledge and a kick in the pants. Are you a professional writer who wants to jazz up your writing? Or a journaler or memoirist looking for a way to express yourself more precisely? Or have you just begun to dabble in writing and need a bit of direction? Or are you just sick of rejection slips from agents and editors? 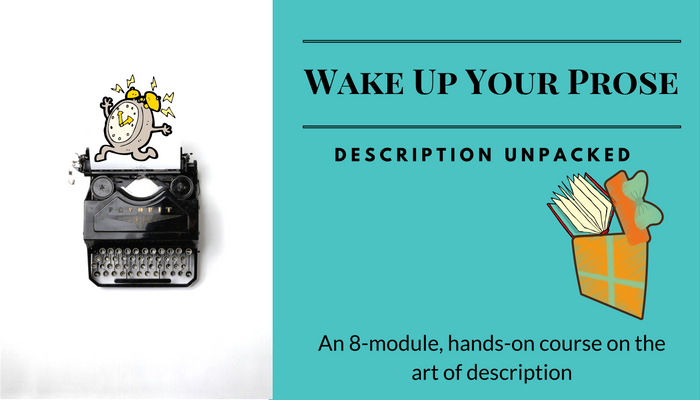 No matter what your MO, my new course, Wake Up Your Prose: Description Unpacked, is for you. You complete the course, your description jumps to new levels, and you have written something you’re proud of because you’re suddenly able to write vivid, authentic prose. I’ll teach you to go deep, to write from your gut, and to apply it to whatever genre is your thing: fiction, nonfiction, content writing, memoir, or shopping lists (just kidding on that last one). Finally, say what you mean and mean what you say. Leave vagueness – but not your brain – at the door. See obscurity bite the dust. You’re going to write anyway, right? Like oxygen, writing is a basic need for you, a compulsion, even. So why not finesse what you already are either doing or obsessing about anyway? The blank page is calling you to greatness. then Wake Up Your Prose: Description Unpacked is for you. Module 2: Method Writing. Write about your own life and develop an arsenal of descriptive tools you can use in your prose. Module 3: Description Basics. The what, why, and how of description; description best practices. Module 4: The Art of Storytelling. Grab your readers from the get-go and use description for story continuity. Module 5: Show. Use emotions and sensory images to enable your readers to experience what your character (fiction or nonfiction) is feeling. Module 6: Tell. Learn how to report in an interesting way. Module 7: Analogy, Metaphor, and Simile. Use what your reader knows to convey something they don’t know. Module 8: The Non-Conclusion. What did we learn? Where do we go from here? Bonus techniques and advice from a veteran editor (me). What kind of time commitment is all this? you ask. The course itself is about 4 hours, and the writing exercises after every module are designed to take between 10 and 20 minutes each. You will receive 2 modules every week to prevent overwhelm and throwing your hands up in frustration. So even in a week or two you can significantly improve your description skills and therefore your writing. Since the course is self-paced, you can take as much or as little time as you wish to go through the modules and complete the exercises. Since this is the beta version of the product and I’m eager for feedback, I decided to price the course at a sweet $47. That’s $5.88 per module for the opportunity to learn from a book and journal editor with over thirty years of experience in the field. I’ve done content editing, technical editing, developmental editing, line editing, copy editing, proofreading, and acquisitions. I’ve worked on novels, law books, translations, philosophy, biography, textbooks, general nonfiction, children’s books, young adult books, comic books – you name it. I know what sounds good and what doesn’t. And I can help you Wake Up Your Prose. Okay, because I like you I’m going to give you a 14-day, money-back guarantee, no questions asked except why it didn’t meet your needs and how I can make it better for you next time. For another $14 you can get a personal, written evaluation of your writing. Give me up to 5 pages of your prose and I’ll go over it like the editor that I am. And you should know that I charge a lot more than $14 to edit 5 pages. Choose either the Regular Package, which includes 8 modules and 8 worksheets, or the Bonus Package, in which you will get both the full course and an evaluation of your writing. The course is currently closed, but if you click here I’ll let you know when it reopens! 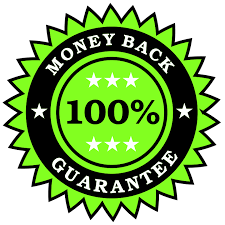 You will instantly be taken to a secure page where you can choose which package you want and pay with no worries whatsoever. After your payment is processed, you’ll immediately receive the first 2 modules and their worksheets. After that, you will automatically receive 2 modules per week for another 3 weeks. Questions? Comments? Compliments? Diplomatically worded complaints? Shoot me an email at Deena@BulletproofWriting.com. P.S. Here’s the link again to be put on the waiting list.